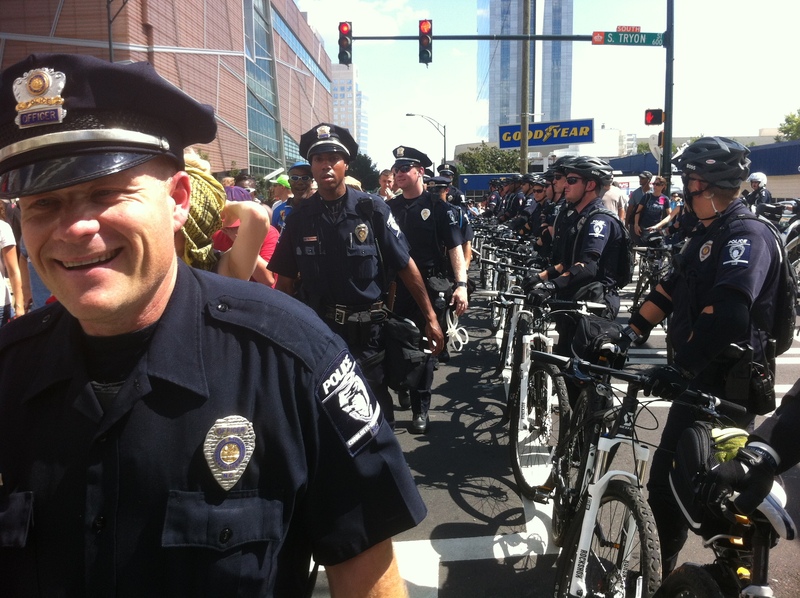 I was initially surprised at the demeanor of the police in Charlotte during the Wall Street South March on the Democratic National Convention (DNC). Having lived in North Carolina for 14 years, I always relish the cordiality when I return. But friendliness by cops at a protest? Last fall I had witnessed aggressive Oakland police in full riot gear during countless occupy marches, club-bearing University of California-Berkeley police attacking students, and I was even arrested by nervous and edgy mall cops while videotaping a Black Friday protest in Raleigh. So today I was taken aback by the police officer who stopped to help me pick up some things I dropped and who was one of a dozen police officers who interacted with me using kind words. Explaining this behavior isn’t simply a question of southern hospitality. While police officers, yes, are people, too, and are facing cutbacks like many public employees across the country, the Charlotte effect was more than that. First, cops could afford to be friendly. Literally. The DNC poured in 50 millions of dollars to the Charlotte-Mecklenburg Police. This helped fund the nifty bicycles and helmets they wore as they escorted protesters. But it also funded countless security cameras and Spot Shotters. But they also could afford the pleasantries because police seemed to outnumber protesters, so there was no threat to their power. An estimated 1000 protesters marched on September 2, but their numbers paled in comparison to the police presence, which included city police from around the state, as well as county and federal law enforcement. Second, however, the kind behavior didn’t last. As the march began to approach the city center, the finance capital hub of the city and much of the country, the smiles faded. 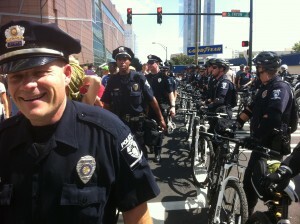 The cops on bikes lining the parade route changed to metal barricades. For a moment, I stepped off of the street protest to walk a bit faster on the sidewalk, but that proved problematic. 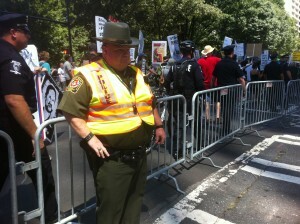 The police would no longer let anyone into the march nor let anyone out. I was told that because I wasn’t “credentialed,” I couldn’t get in, but I witnessed several mainstream media journalists trapped as well. Yes, trapped. With the metal barricades and police officers lining every inch of the curb, activists and journalists inside were “kettled.” This means that the people inside would have had no escape if an incident triggered police use of teargas or other means of assaulting protesters. It also meant that people couldn’t join the march. One couple, with baby in tow, expressed frustration at not being able to participate in the march. “We kept trying to get in at various parts of the march but kept being turned away by the police,” said the mother. 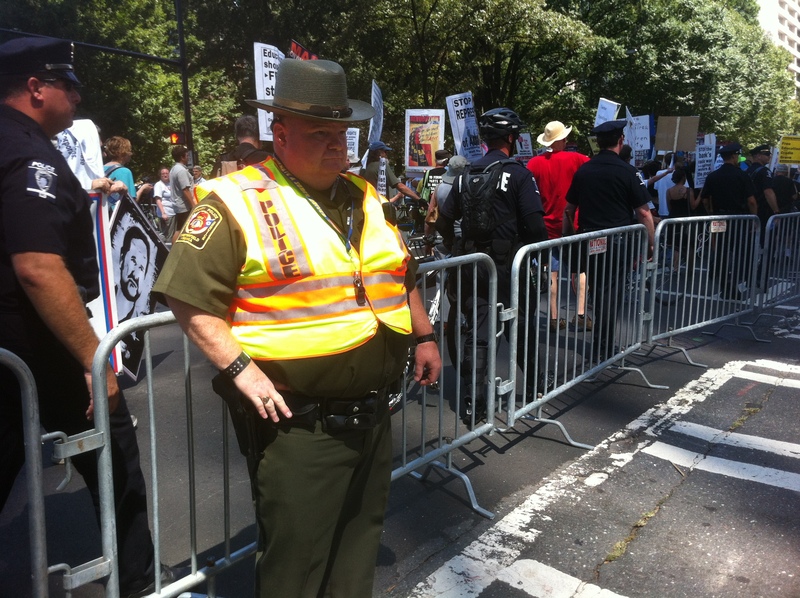 In effect, the barricades – both human and metal – were protecting the financial interests lining this part of the parade route, such as Bank of America and Wells Fargo. Both sides understand the target of the protests. And the banks won’t play nice, either.